Sometimes even cunning diplomats and skilled tacticions will find themselves in situations that call for more subtle strategies. This is where Espionage comes in. In Supremacy 1914 you can gather intelligence or sabotage your opponent with a range of different espionage options. They can be accessed from the Espionage Headquarters (accessible through the main menu). The Espionage Headquarters informs you about the number of spies you have recruited and their daily costs. Spies don't work like regular units but are recruited and deployed directly via the Espionage panel. Spies need to be recruited. Click on the province you want to send the spy to and select recruit. This will cost you £20,000. Spies need to be assigned to a mission. Click on the ✚ next to one of the three missions Intelligence, Economic Sabotage, and Military Sabotage to assign one or more spies. Spies don't perform their mission right away but will try to do so once per day. Spies get a daily salary between £500 and £4,000 per spy per day (depending on the mission). These are charged at day change. You can check the results of your daily spy actions in the Reports tab of your Espionage Headquarters. Note: If the other player runs a Counter Espionage on the province, your own spy might get caught. Both players will be noticed and the spy destroyed. Thus, if you notice strange occurances in your provinces (like dropping resource production or morale), consider deploying a counter spy to investigate and (maybe) expel enemy spies. Intelligence missions cost £2000 per spy and day. Industrial espionage costs £4000 per spy and day. Military Sabotage costs £4000 per spy and day. Defense spies defend against counter intelligence and unmask enemy spies. Counter Intelligence costs £1000 per day. Spies are always exposed to the danger of being caught in their missions if they are stationed on foreign territory. The risk of exposure is different for each spy mission and is vastly increased if an enemy counter intelligence spy is deployed in the same province. Hint: Spies, which are currently not in use cost you £500 per day. Therefore, it is often useful to dismiss no longer needed spies from your service. You can do this with the "discharge" button in the Espionage window. Goldmark can be used to trigger Instant Espionage Actions. 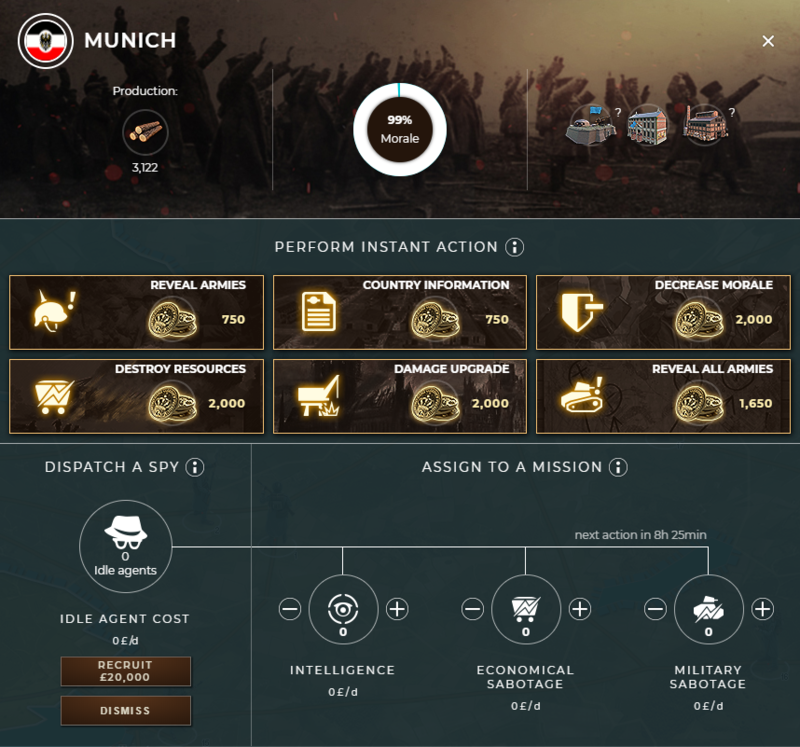 For these actions you do not have to recruit spies and the spy reports will immediately be displayed. Reveals armies in and around the selected province. Discloses the player's resources, diplomatic relations spy positions and factory productions. Decreases morale in the selected province by 10%. Destroys parts of today's resource production of this province. Damage a building in this province, but never the capital. Reveals all of the player's armies. As Instant Espionage Actions have an immediate effect you can chain multiple ones for added effect. However, be careful with sabotage missions: It won't take your opponent long to figure out who is messing with their provinces and they might be ready to retaliate.